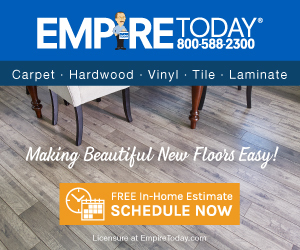 Next review Empire Today "inside scoop"
Empire Carpets charged us too much money. For what we paid, we should have gotten high quality carpet and a thick pad. Instead we got carpet that didn't hold up one year and a very thin pad. They also put the carpet in wrong. It is supposed to be folded over by tile, but it was just cut to the edge and nailed down. We only went with them because we needed carpet in a hurry. Other places provide better carpet and pad for the same money at a fast turn-around. Now I am paying double to replace it. Do NOT use Empire Carpets!! Review #147155 is a subjective opinion of StephanieM. Madoff was another good jewish business man, no ethics, never will be. WHEN YOU DEAL WITH JEWS WHAT DID YOU EXPECT. seems to me this company response guy is currently some store manager and is going around trying to fix his company's mistakes over the internet. what a joke! some of these people dont wanna deal with u nomore! Hey its ok this has happended to 70% of the people who call empire today I know trust me . Dont bother calling that 1800 number or trying to take legal action they will just pay your lawyers off lol! Steer Clear everyone who reads this!